Insist on the Best, We’ll Exterminate your Pests! Subterranean termites, often referred to as “white ants”, are the most economically destructive insects in the world. They feed on all wood or cellulose containing materials and if left uncontrolled will cause weakening and collapse of the structure due to their feeding activity. In the USA, where wood based construction methods are common, it is estimated that termites cause approximately 5 billion dollars worth of damage every year. Subterranean termites are actually very beneficial to the environment as they are some of the few insects which are able to digest wood. Not only do they break down and remove dead trees, they work and aerate soil, enriching it and providing food and harborage for many other forms of life. 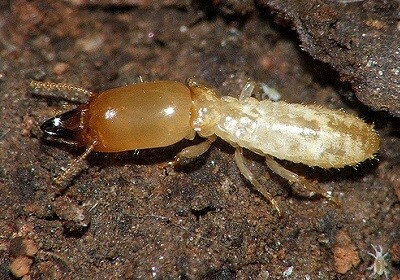 Subterranean termites feed primarily on wood products, their actual sustenance being the cellulose content of the wood. Therefore, where attractive timber is unavailable, items containing cellulose such as cotton, agricultural crops, carpets, leather, books etc. are also targeted. A typical Termite colony will consist of a king and queen that can live upto 25 years in some species, thereafter a supplementary queen will take over. The queens sole purpose within the colony is that of laying eggs. A fully developed queen can lay up to 30 000 eggs per day, thus giving rise to very large nests. A developed termite colony can consist of anything from hundreds of thousands upto 20 million termites. 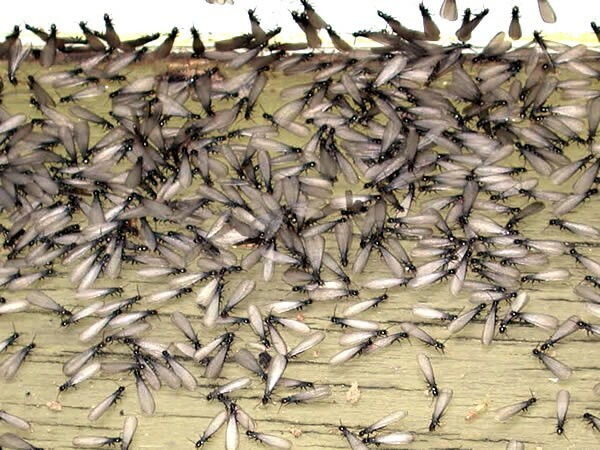 In the warmer more humid months, after the summer rains, it is common to see “flying ants” exiting small mud holes around houses and gardens and “swarming” in the streets and our gardens in their millions. These are actually darker coloured, winged termites, known as “Alates”. The alates are sexually mature termites looking for a mate to establish a new colony in a suitable place. A burried fence post or the base of a dead tree stump would be an ideal location. The alates swarming activity is one of the easiest ways to identify a termite infestation before it becomes too severe, as they may not yet have started infesting the homes timber. The termites could be feeding on a nearby tree or wood pile, until the food source is depleted and they need to forage in other areas (such as your home). Termites live & nest within the soil and travel long distances to forage for food which they return to the nest. They need to maintain constant contact with the ground or other moisture source to survive. This is why subterranean termites create mud tubes to travel over bricks, through cracks in concrete and within walls between their nest and food source. 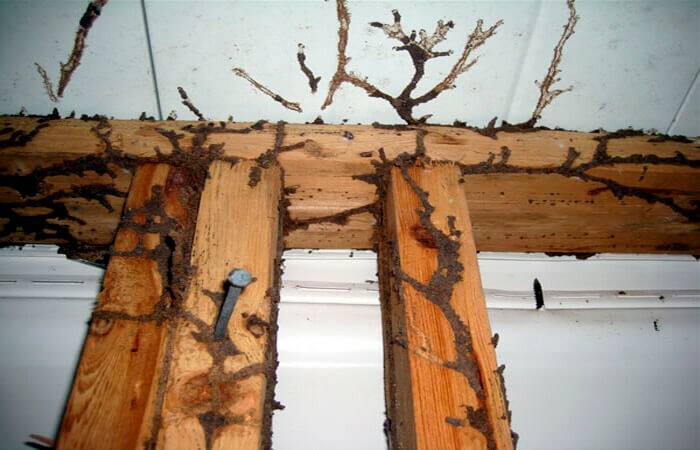 Termites can be extremely difficult to find as they are never seen in the open, rather, the damage they cause is more easily traced. When feeding, termites eat from the inside out, leaving only a thin layer of timber or paint with NO structural integrity. 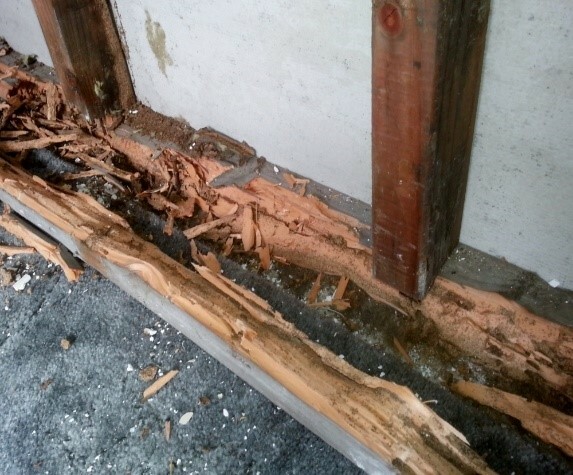 Termites have been known to penetrate a surprising variety of materials to reach wood. Sometimes the worker termites generate a corrosive secretion which is capable of eating through thin metal and capping’s, thus allowing access to the wood beyond. A termite infestation should be treated as early as possible once found as termites can work devastatingly fast in destroying timber. An established colony can infest and destroy all household skirtings within a matter of months if left untreated. Where an infestation is noted outside on a tree or wood pile the general rule is that if termites are seen within 15-20 meters from a structure or home, the property should have a barrier treatment conducted to ensure no infestation occurs. Swift termite control is extremely important as insurance companies usually do not cover the damage caused. Where a termite infestation is prevalent we would need to treat the nests. This is done by drilling through the structures foundations, under the floor and injecting a termiticide into the nests thereby killing the colony and creating a barrier to prevent future infestation. Where termites are infesting a tree or fence pole near the house this will be treated too. For expert advice or a quotation regarding any pest control problem, feel free to contact us and an experienced consultant will conduct a survey of your property and provide an obligation free quotation. 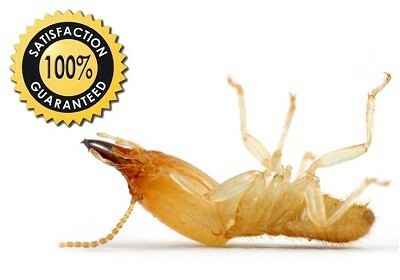 Our pest control technicians are fully trained and experienced in the process of effective termite control. We are fully licensed with the Department of Agriculture, use only termiticides registered under ACT36 of 1947. Pest Control Pros provides the latest pest management services to domestic, commercial and industrial markets with quality service, safety and affordability in mind!